Top row (left to right): Joseph, Clifford, Arthur, Laura. 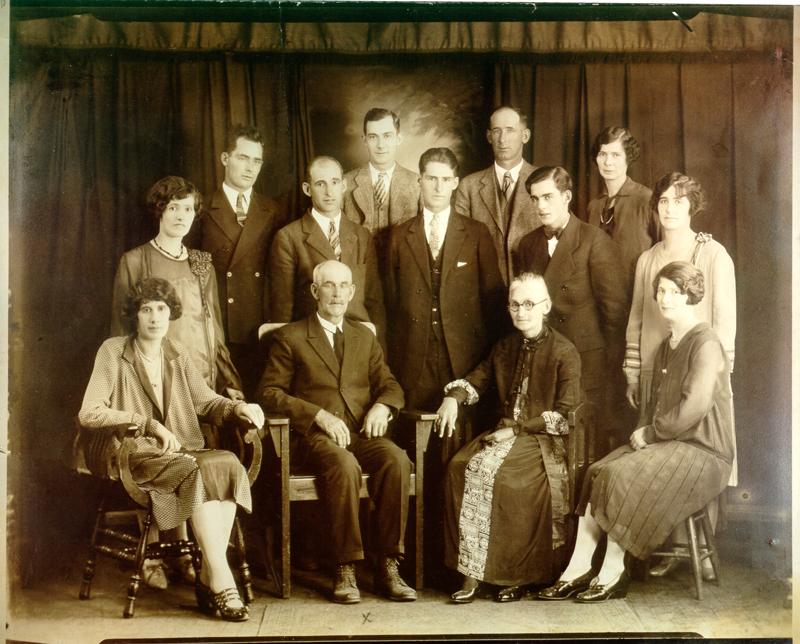 Middle row: Adeline, Hurbain (Erbine), Peter, Laurence, Cecelia. Bottom row: Mary, Euclide, Oliven, Elizabeth. During President Lincoln's leadership, the U.S. government initiated the Homestead Act of 1862 making lands available for a small fee. Already by 1876 the towns of Marinette, Peshtigo, Oconto and Green Bay were active and bustling with large populations of French Canadians. October 1871: Following the Great Peshtigo and Chicago fires, demands for lumber increased. It was at this time that an increased migration of French Canadians, Scots and Irish from Canada, and families from Eastern states occurred in the to-be Pound & Coleman region. The earliest French Canadians to settle Section Seven, 3 miles east of village of Coleman (corner of Ninth Ad), called their settlement Braultville. It was thought that Braultville would be the route for a rumored railroad (and expected village) since Brault's sawmill and the one-room school was in a direct line north of Green Bay. Wisconsin & Michigan Railroad (later Chicago, St-Paul & Pacific R.R.) was built north from Green Bay (1881-82) but extended 3 miles west of Braultyjlle to Iron Mountain. Coleman and the Town of Pound were named at that time in honor of Thaddeus Coleman Pound, a Republican congressman who served on the Committee on Public Lands in 1881 & 1882. Land grants to railroads for construction had been reviewed by his Committee. Grandfather Euclide, 27 yrs, and Grandmother Okven Pecha, 20 yrs, (also spelled Peche or Piche) married in St. Jerome, Canada, January 29, 1882, came to Section Seven as newlyweds. They lived with Euclide's brother, Oliver & wife (Scravani & Pauze ancestors?) already settled in the area (eventually Erbine & Zeia's farm) until they could build their own wood frame house 1/2 mile down the road. Euclide's other brother, Joseph, ( George & Hubert's father) lived on a settled farmstead about 4 miles east. Two more brothers, Eugene and Octave Lesperance also migrated from Canada. Octave moved to Niagara to work in the mill. Eventually Octave (father of Del or, grandparents of Terrance & Hilary) & Eugene (father of Eva Lesperance Kenville, grandparents of Lorraine) settled in Two Rivers area. Oliven's parents, Gideon Piche & wife, migrated to Section Seven also, living out their lives with Euclide & daughter Oliven and the 11 Lesperance children. Louis Piche, Oiven's brother, built a home across the road. Click Here to send a message to the site creator, Gary Lesperance.